Calling all mad scientists: you can now buy everything you need to genetically engineer mutant frogs in the comfort of your own home for the cut-rate price of $499. This (admittedly weird) opportunity comes courtesy of biohacker Josiah Zayner, a former NASA biochemist who earned attention for selling DIY kits for people to fiddle with CRISPR at home, and for injecting himself with CRISPR to make himself more buff via livestream. And now, in what can only be considered the logical progression of those two projects, Zayner is selling kits to hack frogs through his web shop, The Odin. 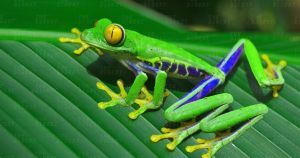 Each kit comes with six green tree frogs native to Georgia and Louisiana, along with cages, food, syringes, and a genetic cocktail. The goal of the treatment is to bulk up the frogs — when injected with that serum, the frogs’ livers are supposed to produce IGF-1, a protein associated with growth in muscle, cartilage, and other cells, according to the product page. In Zayner’s own experiments, the genetic engineering seems to have worked: the weight of the mutant frogs increased by an average of 23 percent, compared to just two percent in a control group. On the product page, The Odin notes the goal of the kits is to educate people about genetic engineering and to encourage the public to take cutting-edge tech into their own hands. It’s not clear whether the injections are healthy for frogs. Bloomberg reports that Zayner believes the kits are legal — the FDA said it doesn’t regulate the kits, and the Animal Welfare Act doesn’t protect cold-blood critters like frogs. So, as long as your conscience doesn’t get in the way, you can now to create all the mutant frogs your home and wallet can handle. The kits are on sale now, and The Odin expects to begin shipping them on October 1. The post You Can Now Genetically Engineer Your Own Mutant Frogs For $499 appeared first on Futurism.